Elkhorn, Montana in the late 1800s. 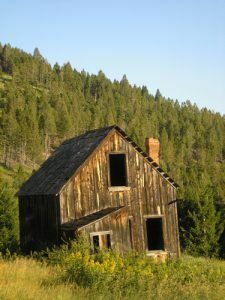 Situated in the Elkhorn Mountains of Montana is the once prosperous mining camp of Elkhorn. Though it still boasts just a few remaining residents, this small town today is a far cry from the bustling activity it displayed more than a century ago. Rich silver deposits were first discovered here by a Swiss immigrant by the name of Peter Wyes in 1870. However, for Mr. Wyes, it would not be a bonanza, as he died mysteriously within a few years of his discovery. In 1875, a Norwegian man named Anton M. Holter, who had already made a name for himself as an entrepreneur and mining magnate, acquired Wyes’ claim and developed what was at first called the Holter Lode. Before long, word got out of the rich silver ores to be mined in the area and a number of other mines were developed including the C & D, Golden Curry, Hard Cash, and Union Mines. The ore from the Elkhorn Mine, the largest in the district, was initially processed with a 5-stamp mill, but by 1881, the mine had reached a depth of 300 feet and needed better refining methods. For a year, the mine then sat silently until further capital could be gained. The Elkhorn Mining Company then took over the property, quickly developing the operation to include a new hoist, and a 10 stamp-chloridizing mill, which was able to process about 11 tons of ore per day. In 1884, a mill was built, and the following year, a smelter. In the late 1880’s Elkhorn reached its peak, supporting a population of about 2500 people, with many more living in the surrounding gulches. Lining Main Street were three hotels, a post office, a two-lane bowling alley, four ice houses, several retail stores, a barbershop, blacksmith, livery, and numerous saloons. The town also boasted a Methodist Church, a school, and hundreds of homes, cabins, and boarding houses. 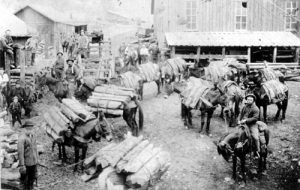 Unlike many other gold camps that were called home to large groups of rowdy single men, Elkhorn’s residents primarily comprised of European immigrant families, who worked not only in the mines but also as woodcutters in the forest. In 1888, the Elkhorn Mining Company increased its stamp mills to 25 and was working the mine some 800 feet below ground, bringing out about $30,000 in ore each month. The next year, the company sold out to a London syndicate for $500,000, which retained the name of the mine, remodeled the mill, and began aggressive development. Hauling the ore got easier too that year when the Northern Pacific Railroad established a branch line from Elkhorn to Boulder. In May 1893, work began on a new Fraternity Hall for the town to serve as a social center. Also located on Main Street, the two-story building featured a large hall on its first floor and a large meeting room on the second. Built in a modified Greek revival architectural style, the Fraternity Hall today still stands and is one of the most photographed buildings in the state. Various lodge meetings were held upstairs, while community events, such as talent shows, dances, concerts, traveling theatre productions, and public meetings were held on the first floor. Outdoor social events were also popular in the camp, such as horse races, rock drilling contests, baseball games, town picnics, and skating parties. By the time the Fraternity Hall was completed; however, Elkhorn’s population had already fallen dramatically, and by then numbered only about 600 people. But Elkhorn’s days were numbered as the mining began to taper off, but the Elkhorn Mine continued operations full time until 1900. The following year, the Elkhorn Mine sold again and revived operations briefly as the Elkhorn Silver Mining Company. After a new mill was erected, many of the old mine dumps were processed. However, when the mine began to fill with water and silver prices remained low, it closed again. In 1906, the water was gotten rid of and the mine opened again, employing about 60 men. By 1908, the workers were treating only mill tailings, which continued on and off again until 1937. Once the mining began to decline, the railroad service to Elkhorn was discontinued and in 1931, the tracks were removed. Over the decades, the Elkhorn Mine produced more than $14 million in silver ore. The town of Elkhorn; however, never truly died, and since the day it began, it has always been populated, though often very sparsely. Today, the preserved Fraternity Hall and Gillian Hall are part of the smallest state park in Montana and are open for visitors. 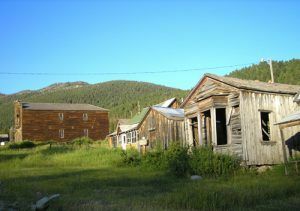 All other properties in the old mining camp are private and many are occupied. The historic cemetery can also be viewed, which unfortunately holds the graves of dozens of children who died in 1888 and 1889 as the result of a harsh winter and diphtheria epidemic. 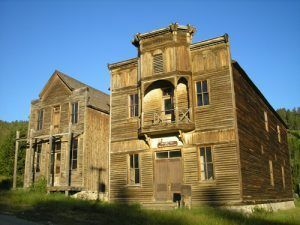 Two of the most photographed buildings in Montana include Gillian Hall on the left and the Fraternity hall on the right. Both buildings form Montana’s smallest state park today. Though Elkhorn is located just eight miles northwest of Boulder, Montana, it is 18 miles by road. From the Boulder exit on I-15, travel south on State Highway 69, about 7 miles, to a well-marked county gravel road. Then turn north and after crossing the Boulder River, turn right. At all other junctions, keep left and travel about 11 miles.